It makes temperature differences as low as possible to lower energy consumption and the operating costs. Open cabinets generate higher sales rate compared to closed cabinets as they provide better visibility, have easy access to products and encourage impulse purchases. It is very important that customers do not feel cold standing in front of the cabinet when they make decisions on food purchasing. For store managers, it also means energy savings, because simple open cabinets consume more energy resulting from the high temperature difference between the product display area and the outside ambient air (the diference is approximatelly 20 oC). Air curtain in front of the refrigerator prevents cold air escaping product display area and protects from the inlet of warm ambient air. With this function, they are able to make huge energy savings and eliminate uncomfortable chilly temperature experienced by shoppers in the refrigerated departments of supermarkets. We have designed dual air curtain to make temperature differences as low as possible to lower energy consumption and, as a result, the operating costs. 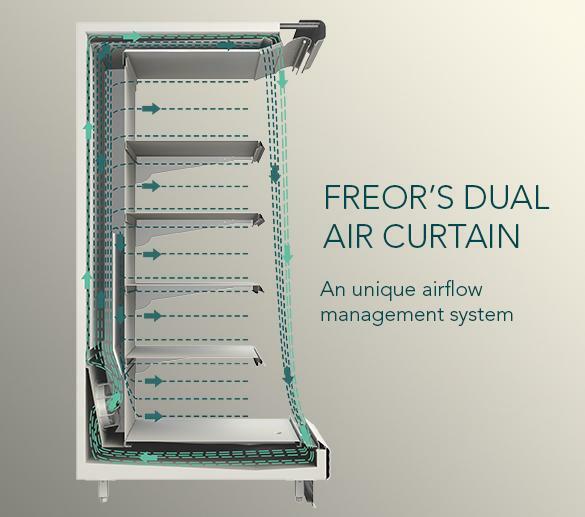 FREOR‘s dual air curtain is a unique airflow management system, designed for open and closed multidecks to ensure customers comfort and deliver energy savings. FREOR‘s dual air curtain can save about 20 % of energy compared to simple open front multideck units, because less cold air is wasted. 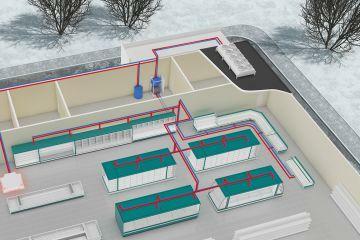 It has a significant impact on supermarkets, where refrigeration usually accounts for up to 50 % of energy consumption. Therefore, dual air curtain is a preferred option for retailers seeking reduced energy usage. Compared to the regular double air curtain systems in the market, where the air is taken from above the cabinet, where it is hot (20-23 oC), FREOR used system is far more energy efficient. 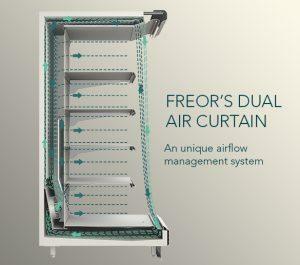 In FREOR‘s dual air curtain technology, the air for the flow is taken from the bottom of the cabinet where the temperature is lower (about +6 oC). This ensures minimum energy used to cool down this air to the needed temperature for the second loop. In FREOR system the dual air flow is formed using the same fans that are used in cooling process. 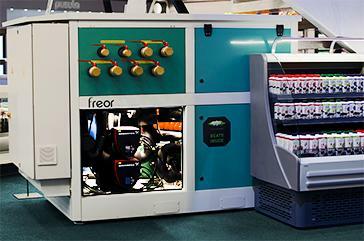 FREOR used system does not require additional fans to ensure the airflow, resulting in energy saving and avoiding extra exploitation costs. The system also eliminates the risk of refrigerator inner space overheating when manual night blinds are closed without switching off the lighting and also the fans. This air curtain is generated by an airflow through a passageway of the refrigerated cabinet that is cooled by evaporators and is discharged from an air outlet in a canopy of the merchandiser. The cool airflow is separated into two air curtains – inner and outer air curtain. The inner cooling air curtain is directed towards the product display area within the case, the chilled air flow down along the open front of the cabinet and is guided through the cabinet into the loop. The outer air curtain functions as a buffer between the inner curtain and the ambient air surrounding the open front of the cabinet so that the heat exchange would be reduced to a minimum. It has a warmer air, so it protects the colder, inner air curtain from the impact of ambient air and also ensures that the customers do not feel the cold when standing in front of the merchandiser while choosing goods. No cold air in front of the cabinet – higher sales rate as a result. Lower energy consumption – cost savings. 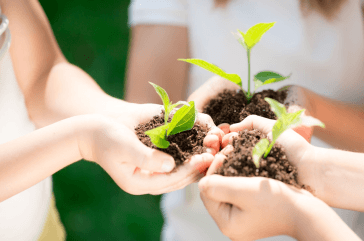 Improved temperature stability – better food preservation. 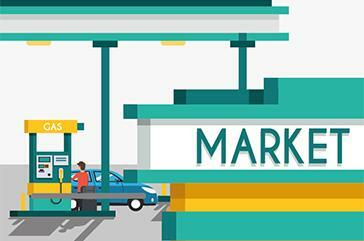 Easy access to products – improved customer experience. Easy restocking – more comfortable working environment for store employees. In all our JUPITER multidecks dual air curtain is incorporated as a standard feature. At FREOR we design customised hydro-agreggates for cold rooms which are fitted with compressors and plate heat exchangers. The units are intended to maintain the temperatures of products stored at cold rooms.